Owning a home is part of the American dream, and it is also the desire of almost everyone in the world. It is not surprising then that there are different ways to complete that goal, and undoubtedly the internet has made it possible for the real estate market to accelerate at a pace that was not previously imaginable. Just like when someone searches for an item for sale as cell phones, today you can identify, detail and seal online purchase through specialized platforms in the real state industry. A renowned platform dedicated to this business with success is Zillow, offering its customers a wide variety to choose to buy, rent or sell a property. But this is just one of the many options that exist, we have prepared a list with the 8 best internet sites in the real estate market, so you can choose which of them you would like to buy, rent or sell a property. Present in this market since 1972, Century 21 has extensive experience that is reflected in its way of serving its customers. When entering the site you will notice that it has a fresh elegant and modern design, a simple search engine and some links of interest, such as contacting an agent or working with them. In addition, they offer properties in 80 countries and territories -mostly tourist destinations and other more attractive for people engaged in international business. You can also filter the results of your search to find a house in a specific county, a vacant lot, luxury homes, affordable houses, or get other details such as which are the nearest schools. However, they usually keep certain details that they prefer to reveal through their real estate agents, but it is not a problem, on the site, it is very easy to locate a contact phone number. 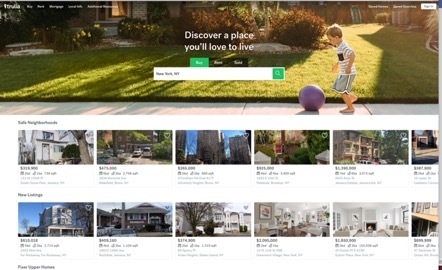 Trulia is a real estate site that provides additional information about homes and apartments for sale or rent -Like neighborhood perspectives, markets, and trends to help you figure out what, where and when to buy, sell or rent. You can find here all sorts of extra info, for example, photos of the street, nearby businesses, schools, construction date, map, crime rate, among other things to know before investing. You can also find a real estate agent, get prices for recently sold homes and see the current prices of houses in your community. An Advice: Before investing in any site get tips and opinions from local real estate agents, brokers, and other local experts through Trulia Voices. We must mention that they are part of the Zillow Group, and manage properties in 1001 cities of the United States, according to the information they provide. Upon entering the site you will see a simple search engine and some featured options. They can also help you contact a local lender for a possible mortgage-based loan. This is the website where the properties traded by the NAR (National Association of Realtors) are offered. In Realtor, you can get access to homes or apartments throughout the country, either for purchase or rent, and it is also a good option to sell yours. 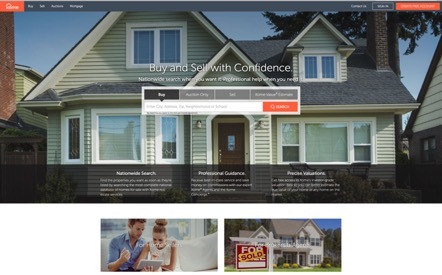 Unlike other websites like Zillow, this one is a bit more dynamic, introducing you to your search engine and purchase, rental and sale options. You can enter your phone number in a box to receive the link to download the app, see some outstanding properties, know the trends, read articles from the real estate sector, obtain a loan pre-approval or know details about the community you have in mind. They are online since 1995 and it is interesting that you can get access to other specialized sites in related sectors, such as gardening, remodeling, and removals, among others. You can also be redirected to member sites of the NAR. 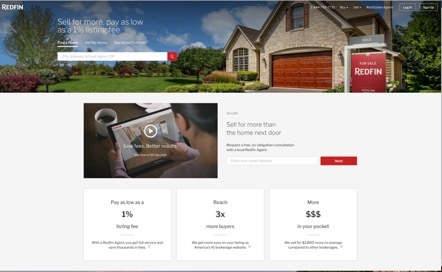 Proud to be the first to have implemented the use of maps in the search for real estate, Redfin is an online company that claims to be focused on the client. For this reason, it is worth mentioning that they apply a contribution commission of 1% (1.5% in certain areas) compared to a contribution commission of 2.5% to 3% more typically used by other real estate companies. To make a difference with the rest of the competitors, they execute what a traditional agent does, but with modern technology to take you home faster, show your property to more buyers and put paperwork online. By combining these two factors, Redfin has helped its clients save more than $ 409 million USD since it opened its doors. Naturally, you will have access to purchase, rent and sale of houses and apartments, although we must point out that they only operate in 45 states of the nation, you should check the list to see if your community is currently included or if your property can be the first one. Xome is a great window of exposure and, therefore, an excellent place to consider real estate purchase options, as they offer a very special property advertising system called big data. In case you decide to sell your house or apartment with them, your property will also be exhibited in Trulia, Zillow, and realtor. Another way they differentiate themselves from the rest of the competition is by offering a sales system called Super Sellers, which combines the power of technology, access to millions of potential buyers, prospects of the local market, professional valuation of housing prices, And the local real estate agents of Xome, to allow you to market and sell your property in a reliable way and paying 0% commission on sale. You can access sales of homes and apartments throughout the country, as well as rentals. A particularly interesting fact is that the auction system is well differentiated from purchases and rentals, you will see the auction calendar, search auctions according to the type of housing you want, among other things. Active in the 50 states of the country and in more than 100 different nations and territories around the world, Re/Max is a well-founded real estate broker with an excellent reputation among its clients. It is especially useful for you if you can afford to acquire luxury properties in destinations such as Milan, the Dominican Republic, Paris, Rome, among others. 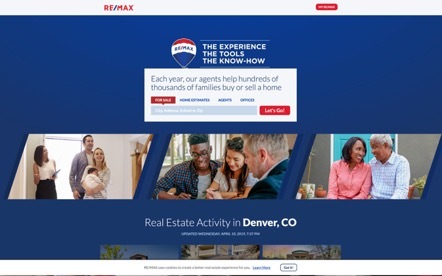 Dedicated to innovation and change in the real estate industry to improve customer service, Re/Max launched Motto Mortgage, a mortgage network with new terms, in 2016 and also acquired a real estate technology company named booj in 2018. 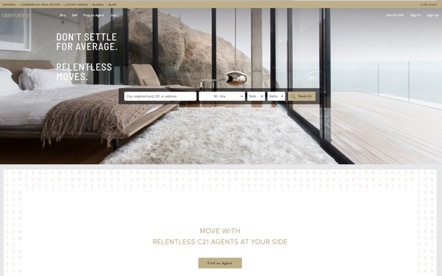 They present the home page with a very friendly image, allowing you in the first instance to access properties for sale, estimate the price of your property, contact an agent or consult offices for sale. There is also direct access to their instructive blog and a download link for the mobile app which offers market updates among other features that you already have on the site. 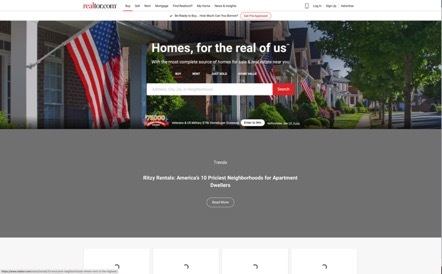 The company “The HomeFinder Group” has been focused, since the acquisition of this domain in 2017, in converting the well-known inherited website of 19 years of age into a modern website. To do this they have simplified the property search system with an easy-to-manipulate search engine and with drop-down options to find an option that is closer to your criteria. You can also browse the site according to 59 states and communities in the country, search for real estate, or go directly to rentals or foreclosures. You need to understand that it is a property listing tool, in fact, by paying $ 39 per month you can upload as many photos of your house as you wish, share your list on social networks and receive a priority ranking. You also have the option of deciding to negotiate directly with potential buyers or tenants, allowing them to send you an email or call directly. In the mortgage center section, you have access to the main agencies of the sector by selecting your current score and the amount to which you aspire to borrow. 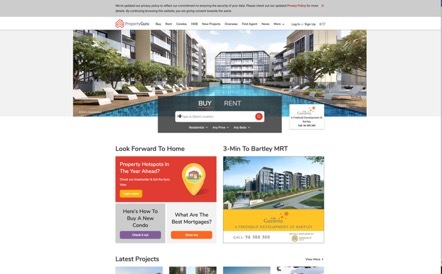 Let’s start by mentioning that Property Guru is a real estate agency that operates in Southeast Asia, more specifically connecting search engines and property sellers in Singapore, Malaysia, Indonesia, Thailand or Vietnam. If you are looking for a property to vacation in Asia or want to open your business in this market, this is the perfect place to start. Property Guru is the leading Real Estate Company in Asia, so it should not be inconvenient to find a good offer on their site. 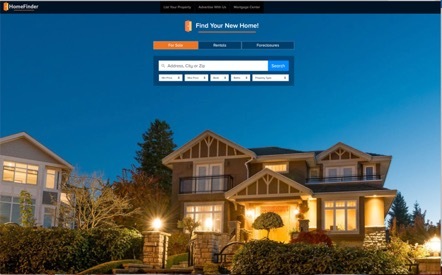 The home page is attractive, presenting a simple search engine to use with 5 filters (including purchase or rental property), in addition to the keyword; it also includes access to new projects, a questions section, and other features. After reading our list you will agree that you have many options at your disposal to search, find, see and buy (or rent) the house, apartment or office you have been looking for, all from the comfort of your home. As expected, you must register a user with personal information and email in most sites. Almost all the options on the list include apps so that you take this seriously and keep yourself updated via phone or tablet. Century 21 and Re / Max are amazing options to look for vocational or simply offshore properties, while others will allow you to find properties and details of their surroundings in the country, such as Redfin and Trulia if you look for something nearby. In the end, it depends on what you are looking for. So, take a nice look at the sites that you feel are fit and let us know how your search went!